Christine Flahive's daughter: "Somebody knows something"
As the cold-case investigation is underway, the daughter of Christine Flahive remembers her mother. 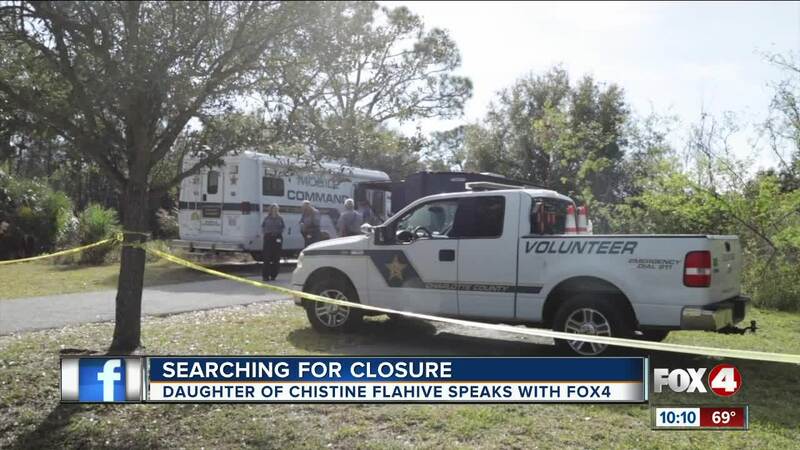 PUNTA GORDA, Fla. — Christine Flahive went missing in 1995 when her daughter, Missina Flahive, was 15 years old. Her best memory of her mother was one Christmas they spent together. "She got me so many things, but one of the items that I had really wanted was this globe,” Missina said. Most of Missina's memories are Christine going to the local bars in downtown Punta Gorda. “She tried her best, don’t get me wrong. my mother, I guess you could call her a wild child?” Missina said. After Christine went missing, Missina stayed at friends' houses before going into foster care until she was 18 years old. “For a long time I didn’t do the right, correct things I was supposed to do but I was young,” Missina said. Now, she lives in New York with three kids and working as a supervisor. She says her life is good. “I’m happy. for the situation I had to grow up with, I’ve turned out very, very well," Missina said. But she still wants the truth to come out about her mother. “Somebody knows something, in regards to what happened to her," Missina said. So she can be at peace and finally put her mother to rest. “She does have a burial spot — she has a plaque and everything. My grandparents made one for her. So it would be nice to put her to rest," Missina said.